Regardless of your relationship with your parents, moving them into your home has the potential to cause a shift in your own overall family relationships. Grandparents in the home can either bring a calming effect or amp up the stress. Everyone involved needs to be realistic about the significant life changes you will be facing. Your parents will be giving up their independence and may feel badly about interfering in your life while you will be giving up space in your home. Having your parents in residence could cause you to feel frustrated at a lack of privacy and 24/7 caregiving. Determine how you will divide responsibilities, particularly for mom or dad, as they move into your home. Will they be responsible for their own laundry and cooking? How will you divide the household chores (if they're physically able to help)? Will you need to be financially compensated for their moving costs or help with groceries, etc. Define the space. Is your home large enough for your parents to occupy their own wing? Will they only have access to a bedroom and everyone will share the bathroom, living and dining rooms and kitchens? Will there be separate entrance ways for the two families? Make sure your home is safe. Is it equipped with bars in the bathroom? Are non-slip rugs in hallways and kitchens? Can they reach important items without the help of a step stool? If possible, don’t make this decision alone. Ask your siblings, your spouse, your children; regardless of how well you interact with your parents and how good a relationship your spouse and children have, it is still a life-changing event. 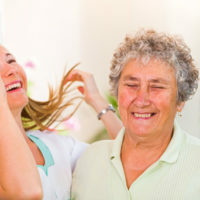 Recognize that at some point, your parents may reach a stage where you will need the help of trained caregivers or they may need to make a move into an assisted living facility or a nursing home. These are items that should be discussed up front, with the entire family. If you decide that moving your parents into your home is a wise and sensible decision, you will want to provide some sense of security and freedom for you and your loved one. You can't be around 24/7 so equipping your home with a medical alert system from LifeFone to help assure their safety when you leave the home is another wise consideration.